“Vitamin D, also known as the sunshine vitamin, is a fat soluble vitamin found in some foods such as fortified milk, oily fish and in some cereals. It is also manufactured by the body when the skin is exposed to sunlight. I received a one-month supply of the new Nature Made Chewable D, and a Chewable D “Family Pack” which included fun vitamin D-related toys and activities including a large bottle of bubbles, 12 mini bottles of bubbles, a beach ball, dinosaur sunglasses, a coloring booklet, and a Webkinz stuffed animal. Cooper absolutely loved all of the fun items included in the Vitamin D Family Pack, but he also loved the vitamins, too! I tried one first just so that I could honestly tell you about the taste, and they really do have a great orange taste! Cooper asks for his every day while I am taking my vitamins. BUY IT! 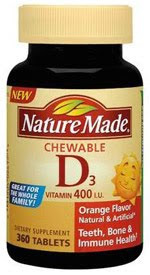 You can purchase your own Chewable D, plus much more at http://www.naturemade.com/. WIN IT! One lucky reader will win the exact same package that I received (bottle of Chewable D, bubbles, beach ball, sunglasses, coloring booklet and Webkinz stuffed animal all in a cute yellow tote). Visit Nature Made and come back and tell me another Nature Made product that you would like to try! Follow me on Twitter and tweet about this giveaway! (Leave your Twitter name and a link) You can tweet this daily: " Nature Made giveaway at Opinions of a Moody Mama #giveaway @coopersmommy http://tinyurl.com/29cqkmh "
I already get their Multi-Vitamins and Vitamin C all the time, but I would like to try their COQ10 soon too. I would like to try the Nature Made Multi For Her Multiple vitamin. Acidopholis...and the printable coupon is useful. I would like to try SamE complete. The For Her Multiple vitamin. I would like to try the Calcium Liquid softgel. I would like to try the Triple Flex. I would like to try the Chewable Vitamin C.
I'm a nature made face book fan. I'd love to try their Cholestoff Complete. Would also like to try the Cholestoff. I would also like to try their chewable Vitamin C.
I'd like to try their Multi For Her vitamins. Email is in my profile. Thanks! I'd like to try Ginkgo Biloba Extract for memory. I would like to try the fish oil. I would like to try their Heart Health. I would like to try the Nature Made SAME. I'm interested in the Magnesium. I need to start taking it daily. I would like to try their Natural sleep aid that is 100% drug free! I would like to try the SAM-e Complete. Maybe it would help get my mood in check. Thanks! I would love to try their CranAssure! I'd like to try the Natural Sleep Aid because I have trouble nodding off at night. I like Nature Made on Facebook. I would like to try the Woman's Multi-Vitamin - I need that! I like to try the Multi For Her ! I would like to try the for her multi vitamin. I would like to try the natural sleep aid. I have some sleep issues and I like to avoid medications at all cost. The natural sleep aid looks like it might be helpful. Thanks for the contest! 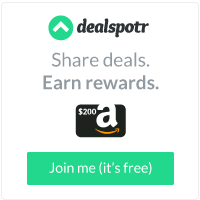 I would like to try there Multi For Her and you can print coupons from there website, added bonus! I am a gfc public follower. I would like to try the Multi For Her vitamins because I don't have a multi. I also would like to try their fish oil-which I do take every day, but would be interested in theirs. I voted for you-carol lewis. Entry 2-I voted for you-carol lewis. I like the Coenzyme Q10. Good stuff! I would like to try the Multi For Her multiple vitamin. Thanks for the chance! I am following you as eddingsfamily. I'd like to try their Vitamin C Liquid Softgel.